Check out our range of fun eagle facts for kids. Learn how they catch their prey, where they build their nests and much more. Read on and enjoy a variety of interesting information about eagles. Eagles are large, powerful birds of prey. Eagles have large, hooked beaks. Eagles have powerful talons which help them catch prey. Eagles build their nests on high cliffs or in tall trees. There are over 60 different species of eagle. Eagles feature prominently on the coat of arms of a large number of countries, such as Germany, Mexico, Egypt, Poland and Austria. Golden eagles have been known to hunt foxes, wild cats and even young deer and goats. 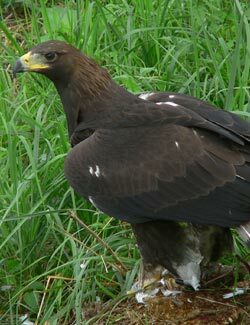 Female golden eagles usually lay between one and four eggs each breeding season. Bald eagles aren’t actually bald. More bald eagle facts.